Arthritis, or joint inflammation, occurs in several different forms, with the most common type, osteoarthritis, affecting 20 million people in America, according to the University of Maryland Medical Center. The mainstay of arthritis treatment is non-steroidal anti-inflammatory medication, or NSAIDs such as ibuprofen, aspirin or naproxen. Alternative treatments for arthritis might appeal to you, if you suffer from side effects such as stomach upset when taking NSAIDs. 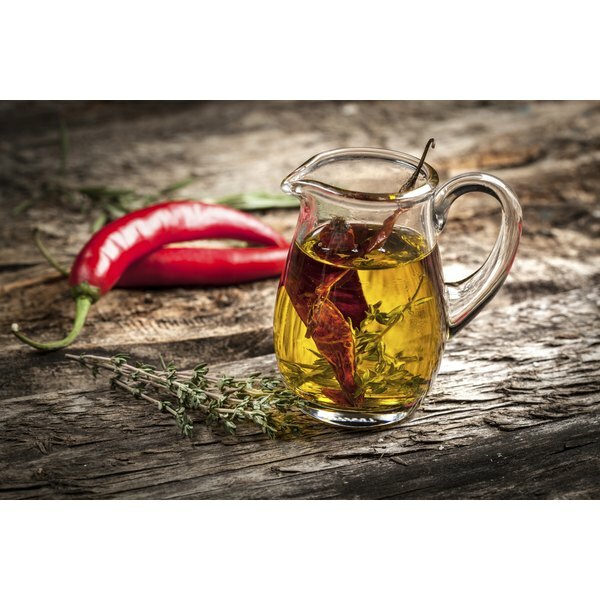 Cayenne pepper and olive oil are two supplements which may have some benefit in treating osteoarthritis. You can find cayenne pepper as oral capsules, with the usual dose being between 30 and 120 mg three times a day. Apply cream containing between 0.025 and 0.075 percent capsaicin to the painful area four times a day. Olive oil can be a part of your diet -- substitute olive oil for other types of cooking oils in salads and other dishes. A study that appeared in the September 2005 issue of “Nature” conducted by researchers from the University of Pennsylvania and the Monell Chemical Senses Center looked at olive oil’s similarity to NSAIDs. The study found that oleocathin, a substance found in olive oil, has similar properties to NSAIDs in inhibiting Cox-1 and Cox-2 enzymes, which can cause chronic inflammation. The Mediterranean diet, which uses large amounts of olive oil in food preparation, may reduce inflammation and benefit those with arthritis in similar ways to omega-3 fatty acids, which are known to decrease inflammation. Cayenne pepper can sting the eyes and skin when used in the cream form. Do not touch the eyes or broken skin after applying capsaicin cream. Oral capsaicin can irritate the stomach or cause stomach ulcers. Heat can burn your skin after cream application -- don’t use heating pads, or take a hot bath or shower right after application. Cayenne pepper has crossover allergic reactions to other substances. If you have an allergy to latex, avocado, bananas, chestnuts or kiwi, do not take cayenne pepper. Because capsaicin can increase stomach acidity, don't use cayenne if you are taking stomach acid reducers. Capsaicin can also increase the risk of bleeding in people who take blood thinners or have bleeding disorders. Do not use cayenne pepper without discussing its use with your medical practitioner. The only risk to olive oil consumption is that olive oil contains about 120 calories per tablespoon, so watch your intake if you’re dieting.